New Zealand has two outstanding advantages. 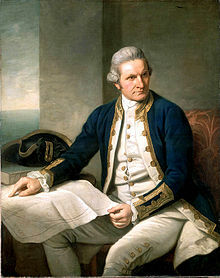 Firstly, it has a tiny population, only four million, a quarter of which live in Auckland, leaving huge swathes of land to farming and best of all, to wilderness. 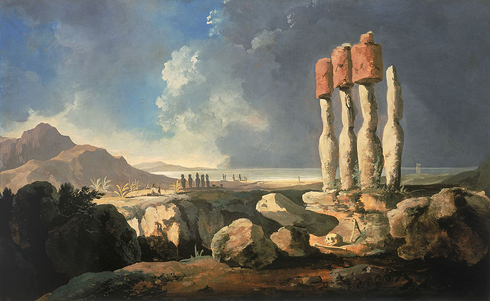 And that brings me to its second feature, its tear-jerkingly, breathtakingly, largely-unspoiled, gobsmackingly gorgeous landscape. Formed by volcanoes and carved by glaciers, the landscape leaves you gasping in awe and wondering where is everyone? And coming from a filthy dirty, light-polluted, noisy, overcrowded island like Great Britain, that’s a refreshing and glorious feeling! Someone had re-punctuated the sign from ‘scenic lookout’ to ‘scenic, lookout!’ which amused us. Virtually everywhere is a scenic lookout in NZ. 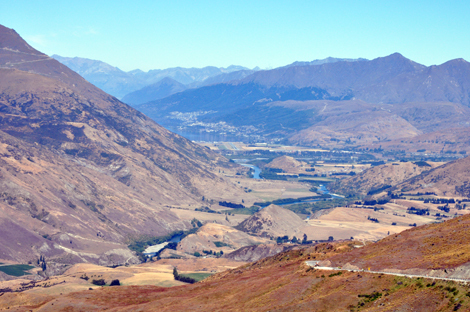 This breathtaking view looks down towards Arrowtown. 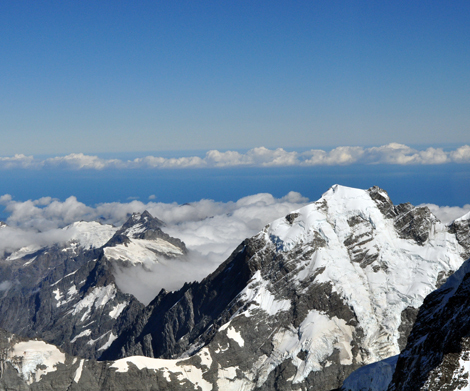 Mount Cook in the Southern Alps is the highest peak in New Zealand. 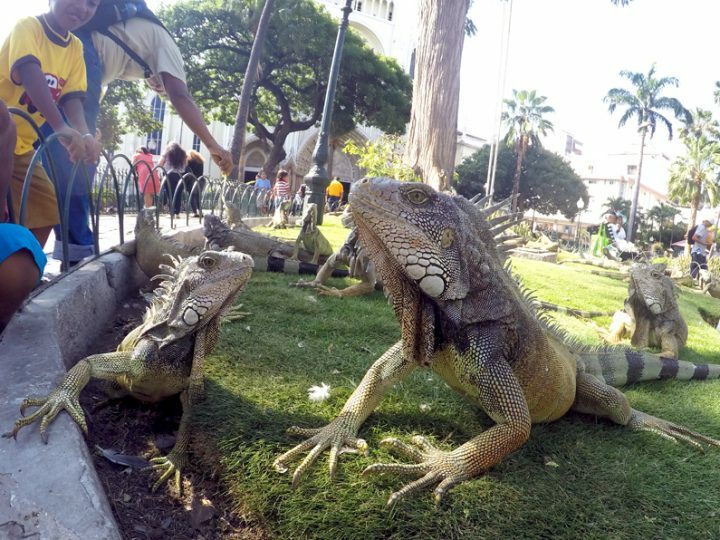 We saw it from a helicopter, but more on that story later. 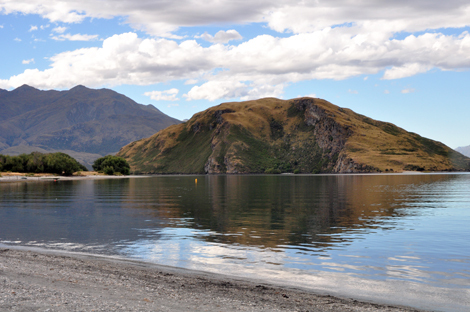 Lake Wanaka’s Glendhu Bay is surely one of the most beautiful places on the planet! There were only another eight people there. 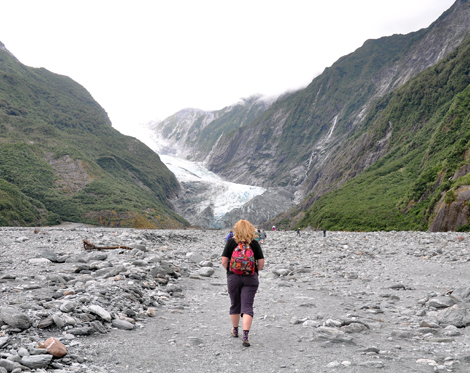 The Franz Josef glacier is one of NZ’s top tourist attractions, and as you can see, it’s hardly busy at all. 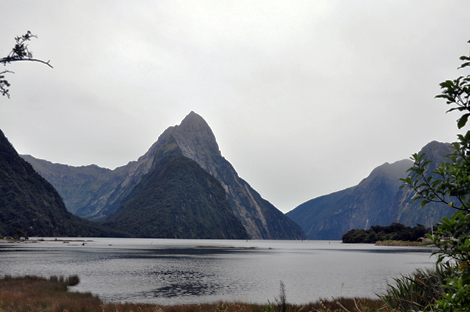 At Milford Sound it rains hard two days out of every three. We got lucky and had a dry morning, The scale of this place is hard to get your head round when you are there, let alone convey in a photograph. 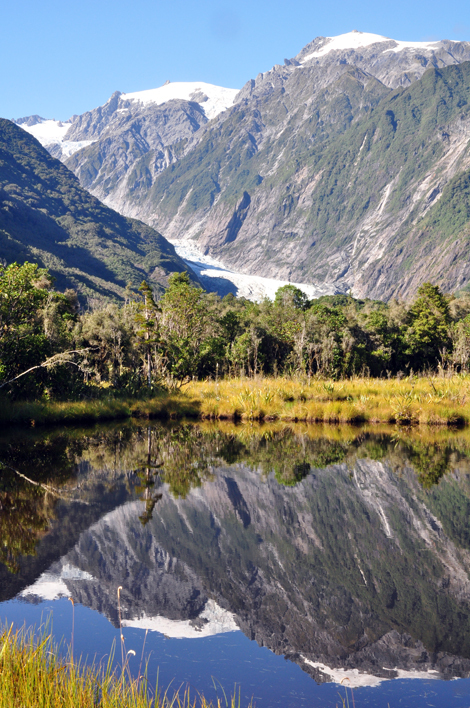 The Franz Josef glacier, reflected in the tiny glacial Peter’s Pool makes your heart sing with joy. 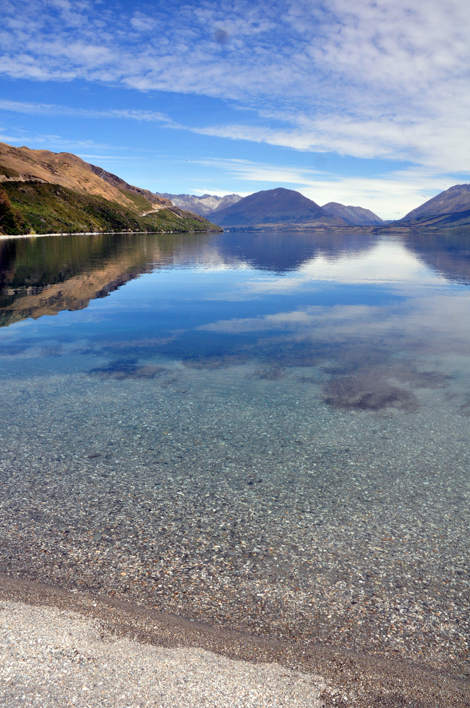 The waters of Lake Wanaka, like all the lakes we came across were unsullied and crystal clear. 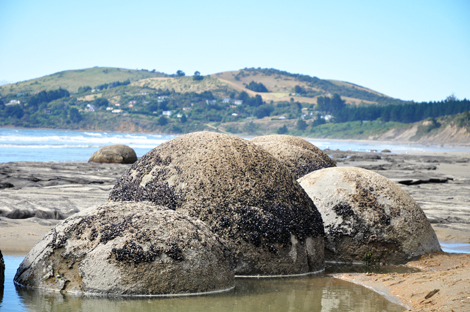 Moeraki boulders, just lying on the beach are great bubbles of stone all of them hollow. Being close to the main road going north, there were quite a lot of people there, perhaps as many as 100! 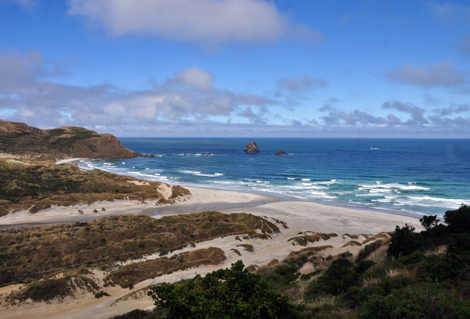 We had beautiful Sandfly Bay on the Otago peninsula to ourselves. 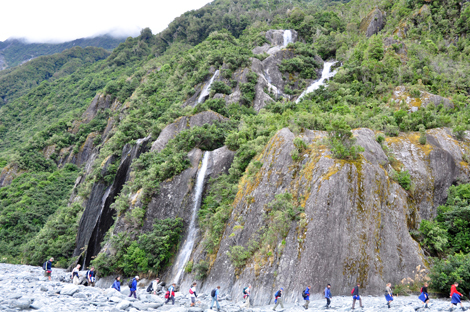 Waterfalls abound in NZ, this one was hardly even noticed by this crocodile of trampers.